Looking to try something new and fun? 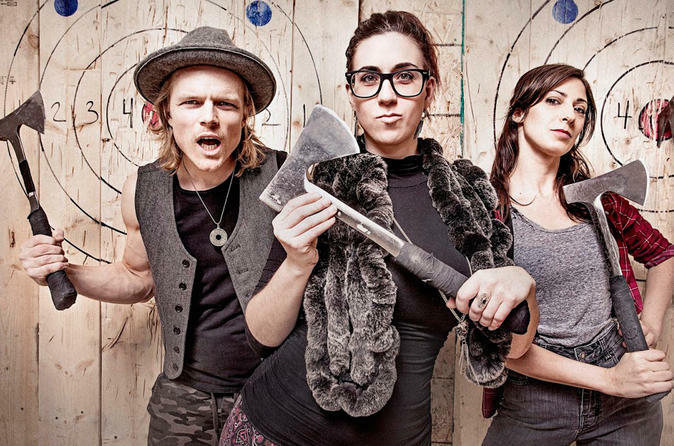 We’re excited to introduce you to the sport of axe throwing! This thrilling traditional Canadian backyard pastime is now bigger than ever in urban communities. With the help of our talented axe throwing coaches, guests are able to share our passion for nailing the bullseye. No experience necessary, all skill levels are welcome! Enjoy a one hour axe throwing session with a dedicated axe throwing coach. Coaches provide a safety talk, demonstrate throwing techniques and are there to guide you through your experience. Once confident with the basics, coaches may introduce a variety of simple and advanced trick shots as well as facilitate games to crown a member of your group the ultimate axe throwing champion. No experience necessary, all skill levels are welcome. We promise you'll be nailing the bullseye in no time and feeling pretty Bad Axe! Spend an hour learning a new, fun and competitive skill!